The truest hero does not think of himself as one, never advertises himself as such and does not perform the acts that make him a hero for either fame or fortune. He does not wait for government to act if he senses an opportunity to fix a problem himself. 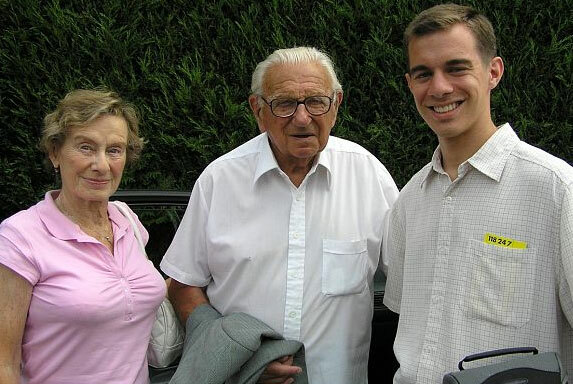 On July 27, 2006 in the quiet countryside of Maidenhead, England, we spent several hours with a true hero: Sir Nicholas Winton. His friends call him "Nicky." In the fall of 1938, many Europeans were lulled into complacency by British Prime Minister Neville Chamberlain, who thought he had pacified Adolf Hitler by handing him a large chunk of Czechoslovakia at Munich in late September. Winston Churchill, who would succeed Chamberlain in 1940, was among the wise and prescient who believed otherwise. So was Nicholas Winton, then a 29-year-old London stockbroker. Having made many business trips to Germany in previous years, Winton was well aware of Jews being arrested, harassed and beaten. The infamous Kristallnacht of November 9, 1938 — in which Nazi thugs destroyed Jewish synagogues, homes and businesses while murdering scores of Jews across Germany — laid to rest any doubts about Hitler’s deadly intentions. His increasingly aggressive anti-Semitism and Germany’s occupation of the Sudetenland in October 1938 spurred a tide of predominately Jewish refugees. Thousands fled to as-yet unoccupied Czechoslovakia, especially to Prague. Some had relatives and friends to move in with, but many settled into makeshift refugee camps in appalling conditions in the midst of winter. Winton had planned a year-end ski trip to Switzerland with a friend, but was later convinced by him at the last moment to come to Prague instead because he had "something urgent to show him" — namely, the refugee problem. Near Prague, Winton visited the freezing camps. What he saw aroused deep feelings of compassion within him: orphans and children whose parents had already been arrested, and families desperate to somehow get at least their children out of harm’s way. Jewish parents who were lifetime residents and citizens in the country were also anxious to send their children to safety, hoping in vain that the storm would blow over. They, like Winton, sensed that the Nazis wouldn’t rest until they took the rest of the country, and perhaps all of Europe as well. The thought of what could happen to them if the Nazis devoured the rest of Czechoslovakia was enough to inspire this good man into action. It would have been easy to assume there was nothing a lone foreigner could do to assist so many trapped families. Winton could have ignored the situation and resumed his vacation in Switzerland, stepping back into the comfortable life he left behind. Surely, most other people in his shoes would have walked away. Despite the talk of "peace in our time," Winton knew the clock was ticking. If any help could be mustered, it needed to come quickly. The next steps he took ultimately saved 669 children from death in Nazi concentration camps. Getting all the children who sought safety to a country that would accept them seemed an impossible challenge. Back in London, he wrote to governments around the world, pleading for an open door, only to be rejected by every one (including the United States) but two: Sweden and Great Britain. He assembled a small group of volunteers to assist with the effort. Even his mother pitched in. The London team’s counterpart in Prague was a Brit named Trevor Chadwick. He gathered information from parents who wanted their children out, then forwarded the details to Winton, who used every possible channel in his search for foster homes. There were 5,000 children on his lists. At no charge, British newspapers published Winton’s advertisements to stir interest and highlight the urgent need for foster parents. When enough homes could be found for a group of children, Winton submitted the necessary paperwork to the Home Office. He assisted Chadwick in organizing the rail and ship transportation needed to get them to Britain. Winton also took the lead in raising the funds to pay for the operation. The expenses included the 50 British pounds the Home Office required for each child (the equivalent of $3,500 per child in today’s dollars) to cover any future costs of repatriation. Hopes that the danger would pass and the children could be returned evaporated as war clouds gathered in the spring and summer of 1939. Picture in your mind the unimaginable: the railway station in Prague when anguished parents and relatives loaded the children onto the trains and said what would be for most, their final goodbyes. Boys and girls, many younger than five, peered out the windows of the steaming trains wondering about their uncertain future. No one knew if they would ever be reunited with their families again. The first 20 of "Winton’s children" left Prague on March 14, 1939. Hitler’s troops overran all of Czechoslovakia the very next day, but the volunteers kept working, sometimes forging documents to slip the children past the Germans. By the time World War II broke out on September 1, the rescue effort had transported 669 children out of the country in eight separate groups by rail. A ninth batch of 250 more children would have been the largest of all, but war prompted the Nazis to stop all departures. Sadly, none of those children lived to see the Allied victory less than six years later. Pitifully few of the parents did either. Vera Gissing, one of the children Winton saved, and now in her late 70s, puts the rescue mission in perspective: "Of the 15,000 Czech Jewish children taken to the camps, only a handful survived. Winton had saved a major part of my generation of Czech Jews." Vera’s story is an especially poignant one. She was 10 years old when she left Prague on the fifth train on June 30, 1939. Two of her cousins were on the ninth train that never made it to freedom. Her mother died of typhus two days after liberation of the Bergen-Belsen concentration camp to which she was sent. Her father was shot in a Nazi death march in December 1944. Vera has no doubt about her own fate had it not been for Nicholas Winton. Why did he do it? It certainly was not for the plaudits it might bring him. Indeed, he never told anyone about his achievement for half a century. Not until 1988, when his wife stumbled across a musty box of records and a scrapbook while cleaning their attic, did the public learn of Winton’s story. The scrapbook, a memento put together by his volunteers when the operation shut down, was filled with documents and pictures of Czech children. For all those decades, the children and the families who took them in knew little more than the fact that some kind soul, some guardian angel, had saved their lives. What compelled this man to take on a challenge ignored by almost everyone else? We sat down with Vera and Nicky at the latter’s home in late July to ask this very question. One would hardly guess that Nicky is 97; he looks and speaks with the vigor of someone years younger. He greeted us heartily, escorting us through his living room and into the backyard where he picked some fresh mulberries for us. He still tends to the gardens around his house. This is a quiet man. In some ways he is a reminder of Aristotle’s magnanimous man (from his "Nicomachean Ethics"). Aristotle said the good-souled man is ashamed to receive benefits, and always repays more than he has received. "It is the characteristic of the magnanimous man to ask no favor but to be ready to do kindness to others," he wrote in his Ethics. You hear no boasting from Nicky, no words designed to put any special focus on what he did. In a matter-of-fact fashion, he told us, "Because it was the thing to do and I thought I could help." One can’t help feeling drawn to a man for whom doing good for its own sake seems to come so naturally. In "The Power of Good," a recent International Emmy Award-winning documentary from Czech producer Matej Minac, Nicky says he kept quiet about the rescue mission because "it was such a small part of my life." Indeed, the operation spanned only eight months, while he was still working at the stock exchange, and it was prior to his marriage. Still, to us, the explanation seemed inadequate. We pressed him on the point. "When the war started and the transports stopped, I immediately went into the RAF (Royal Air Force), where I stayed for the next five years. When peace came, what was a 35-year-old man to do, traverse the country looking for boys and girls?" At the end of the war, Nicky Winton was busy re-starting his own life. What he did to save so many others just six years earlier was behind him, and over. For all that he knew, the children might have returned to their homeland (as indeed, some did). "Wherever they were, I had good reason to assume they were safe and cared for," he said. Indeed, among their ranks in later life would be doctors, nurses, therapists, teachers, musicians, artists, writers, pilots, ministers, scientists, engineers, entrepreneurs and even a Member of the British Parliament. Today they and their children, grandchildren and great-grandchildren number about 5,000. Recent interviews with many of the adult "Winton Children" reveal not only a deep appreciation for the man whose initiative saved them, but also for living life to its fullest. Many express a lifelong desire to help others as a way of honoring the loved ones who made the painful choice to trust the young stockbroker from Britain. "We understand how precious life is," Vera told us. "We wanted to give something back to our natural parents so their memory would live on." Years after coming to Britain, Vera asked her foster father, "Why did you choose me?" His reply sums up the spirit of the good people who gave homes to the 669: "I knew I could not save the world and I knew I could not stop war from coming, but I knew I could save one human soul." So humble is Nicky Winton that others have to tell him, over his own objections, just what an uncommon man he is. Like the other "Winton Children" who have come to know him now, Vera reminds him frequently that she owes her very life to him. In our effort to add to the chorus of friends and admirers who want Nicky Winton to understand just how we feel about him, we told him this: "You did not save only 669 children. Your story will elevate the moral eloquence of lending a loving hand when lives are at stake. Some day, somewhere, perhaps another man or woman will confront a similar situation and will rise to the occasion because of your example. This is why the world must know what you did and why we think of you as a hero even if you do not." In 1988, a television show seen across Britain, "That’s Life," told the Winton story to a large audience and brought Nicky together with many of his "children" for the first time since those horrific, fateful days of 1939. He is in regular correspondence with, and often visited by, many of them — a source of joy and comfort since his wife Grete passed away in 1999. Vera, who lives just a few miles from Nicky, sees him regularly. She has co-authored a book which tells the full story, "Nicholas Winton and the Rescued Generation: Save One Life, Save the World." Governments have honored Nicky with awards and the recognition he never sought. In 1999 he was granted the Honorary Freedom of the Royal Borough of Windsor and Maidenhead for a lifetime dedicated to humanitarian activities. This award makes Nicky a member of a small elite group, which includes Queen Elizabeth, the Duke of Edinburgh and Prince Charles. The Queen has conferred a knighthood upon him. President George W. Bush wrote him earlier this year, expressing gratitude for his "courage and compassion." The documentary, "The Power of Good," is slowly spreading the Winton story around the world, as are an earlier, superb dramatization called "All My Loved Ones" and, of course, Vera’s book. In a world wracked by violence and cruelty, Nicky Winton’s selfless actions nearly seven decades ago should give us all hope. Edmund Burke once said, "All that is necessary for the triumph of evil is for good men to do nothing." It’s more than a little comfort to know that in our midst are men and women like Nicky Winton whose essential decency can, and did, triumph over evil. Authors’ postscript: Three weeks after meeting Nicky in England, we learned another remarkable fact about him that never came up during our visit. On his 94th birthday in May 2003, he became the oldest man to fly in an ultralight aircraft (known in the U.K. as a "microlight"). He did it to raise money for one of his favorite charities, Abbeyfield Houses for the aged. His pilot in the two-seater was Judy Leden, a world champion microlight flyer and daughter of one of the children Nicky saved in 1939. Lawrence W. Reed is president of the Mackinac Center for Public Policy, a research and educational institute headquartered in Midland, Mich. Benjamin D. Stafford is an economics major at Hillsdale College and a summer 2006 intern with the Center. Permission to reprint in whole or in part is hereby granted, provided that the author and the Center are properly cited. Both the book, "Nicholas Winton and the Rescued Generation," and the film, "All My Loved Ones," are available now from Amazon.com. The fourth edition of Vera Gissing’s personal reminiscences, "Pearls of Childhood," will be published in January 2007. 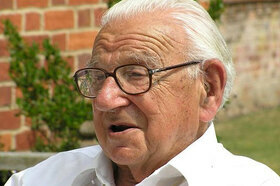 For more information on Nicholas Winton, see www.powerofgood.net.